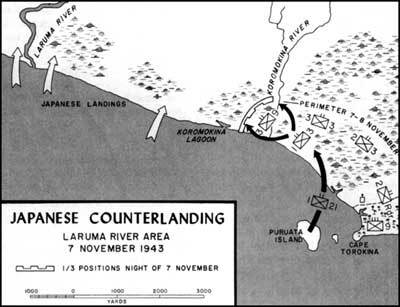 Back on Bougainville, following the landing, the days D plus 1 to D plus 5 saw the initiation of Phase II of the operation, involving shifting of units' positions, reorganizing the shambles of supplies, incessant patrols, road building, the beginning of the construction of a fighter airstrip, and the deepening of the beachhead to 2,000 yards. Then, at dawn on the morning of 7 November (D plus 6), the Japanese struck. Four of their destroyers put ashore 475 men well west of the Marine perimeter, between the Laruma River and the Koromokina Lagoon. They landed in 21 craft: barges, ramped landing boats, even a motor boat, but, to their disadvantage, along too wide a front for coordinating and organizing a strike in unison and immediately. A Marine Corps combat correspondent, Sergeant Cyril J. O'Brien, saw the skinny young Japanese who scampered up the beach with 80-pound packs two-and-a-half miles from the Laruma to near the Koromokina, left flank of the Marines, to join their comrades. They were eager enough, even to die. A little prayer often in the pockets of the dead voiced the fatalistic wish that "whether I float a corpse under the waters, or sink beneath the grasses of the mountainside, I willingly die for the Emperor." The first few Japanese ashore near the Laruma, however, did not die. An antitank platoon with the 9th Marines did not fire because the landing craft in the mist looked so much like their own, even to the big white numbers on the prow. Near Koromokina, they seemed to be all over the beach. One outpost platoon, which included Private First Class John F. Perella, 19 years old, was cut off on the beach. Perella swam through the surf 1,000 yards to Marine lines and came with a Navy rescue boat and earned a Silver Star Medal. Lieutenant Colonel Walter Asmuth, Jr., commanding officer of the 3d Battalion, 9th Marines, ordered a company attack, called on mortars and the artillery of the 12th Marines. The Japanese were well equipped with the so-called knee mortars (actually grenade launchers) and Nambu machine guns and fought back fiercely. 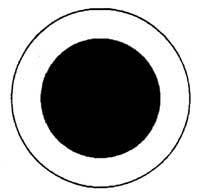 In that jungle, you could not see, hear, or smell a man five feet away. Private First Class Challis L. Still found a faint trail and settled his machine gun beside it. An ambush was easy. The lead Japanese were close enough to touch when Still opened up. 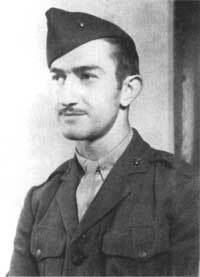 He killed 30 in the column; he was a recipient of the Silver Star Medal. Yet, the Japanese didn't give way. Ashore only hours, they had already dug strong defenses. Even a Marine double envelopment in water, sometimes up to the waist, did not work. By 1315, the weakened 9th Marines company was relieved by the 1st Battalion, 3d Marines, coming in from the beachhead's right flank. Called the "Buckeye" Division, the 37th was among the very first American troops sent to the Pacific at the beginning of the war. The 37th was an outfit with a long history and many battle streamers, dating from August 1917, when it was formed at Camp Sheridan, Alabama. It left for overseas in 1918, and took part in five major operations in France before returning in 1919, and facing demobilization that same year. As an Ohio National Guard unit, the "Buckeye" Division was inducted into federal service in 1940, and by June of 1942, it was heading into the Pacific war, sent to garrison the Fiji Islands. First combat was on New Georgia, which included taking the critical Munda airfield. The 37th joined the 3d Marine Division on Bougainville, and then trained on the island for the campaign on Luzon Island in the Philippines. Landing with the Sixth Army at Lingayen Gulf, 9 January 1945, the 37th raced inland to Clark Field and Fort Stotsenburg. It entered Manila, and its commander, Major General Robert S. Beightler, accepted the surrender of General Tomoyuki Yamashita. Next came the capture of Baguoi and liberation there of 1,300 internees at the Bilibid Prison. The division came home for demobilization in November 1945. Its commander, Major General Beightler, was born 21 March 1892, and enlisted in the U.S. Army as a private in 1911. Promoted quickly to corporal, sergeant, and then first sergeant of his company, he was then commissioned as a second lieutenant in March 1914. After service on the Mexican border, he took part in five major campaigns in World War I with the famous 42d (Rainbow) Division. A graduate of Ohio State University, Beightler finished first in his class in the Reserve Officers' Course of the Command and General Staff School, Fort Leavenworth, Kansas, in 1926. After that he served as a member of the War Plans Division of the War Department General Staff (1932-36). After World War II, he assumed command of the Fifth Service Command at Fort Hayes, Ohio, and then was assigned (1947) to the Personnel Board of the Secretary of War. 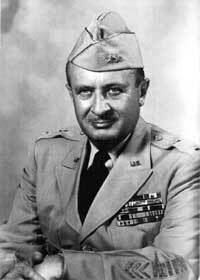 In 1949, he was sent to the Far East and took over the Marianas-Bonins Command on Guam. In 1950 he was named Deputy Governor of the Ryukyus Command on Okinawa. Major General Beightler received the Distinguished Service Cross, the nation's second highest honor, for his leadership in the Philippine campaign, as well as a Distinguished Service Medal for the New Georgia operation, with an Oak Leaf Cluster as a second award for his outstanding service on Bougainville and then on Luzon in the Philippine Islands. He also wore the Legion of Merit with Oak Leaf Cluster, the Bronze Star with Oak Leaf Cluster, the Silver Star Medal, and the Purple Heart. He died 12 February 1978. The 1st Battalion was close to the enemy, close enough to exchange shouts. The Japanese yelled "Moline you die" . . . and the Marines made earthy references to Premier Tojo's diet. Marine Captain Gordon Warner was fluent in Japanese, so he could quickly reply to the Japanese, even yell believable orders for a bayonet charge. He received the Navy Cross for destroying machine gun nests with a helmet full of hand grenades. He lost a leg in the battle. Sergeant Herbert J. Thomas gave his life near the Koromokina. His platoon was forced prone by machine gunfire, and Thomas threw a grenade to silence the weapon. The grenade rebounded from jungle vines and the young West Virginian smothered it with his body. 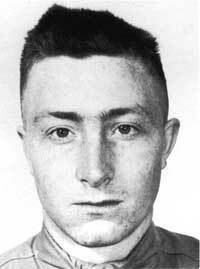 He posthumously was awarded the Medal of Honor. General Turnage saw that reinforcements were needed. The day before (6 November) the first echelon of the 21st Marines had come ashore. Now the battle command was transferred to Lieutenant Colonel Ernest W. Fry, Jr., of the 1st Battalion. With two companies, he was set for a counterattack, but not until after two intense saturations of the Japanese positions by mortars and five batteries of artillery. They slammed into a concentrated area, 300 yards wide and 600 deep, early on 8 November. Light tanks then moved in to support the attack. When Colonel Fry's advancing companies reached the area where the Japanese had been, there was stillness, desolation, ploughed earth, and uprooted trees. Combat correspondent Alvin Josephy wrote of men hanging in trees, "Some lay crumpled and twisted beside their shattered weapons, some covered by chunks of jagged logs and jungle earth, [by] a blasted bunker . . . ." In that no-man's land, Colonel Fry and his men walked over and around the bodies of over 250 enemy soldiers. To complete the annihilation of the Japanese landing force, Marine dive bombers from Munda bombed and strafed the survivors on 9 November. By now, the veteran 148th Infantry, the first unit of the Army's 37th Infantry Division, was coming ashore, seasoned in the Munda campaign on New Georgia. Later, to take over the left flank of the beachhead, would come its other infantry regiments, the 129th on 13 November and the 145th on 19 November. The Army's 135th, 136th, and 140th Field Artillery came ashore, too, and would be invaluable in supporting later advances on the right flank. Major General Robert S. Beightler, USA, was division commander.